I may be selling these sites and working full time for HTC now, but who says I can't have a little more fun giving away a great prize before I go? Last week I posted about the new Audioengine A5+ powered desktop speakers; the generous folks at Audioengine have offered up a set of these new speakers for a contest. With dual inputs (3.5mm and RCA, the latter of which is easily converted to an addition 3.5mm input with a cable) and a USB charging port, the A5+ speakers are a great companion to an endless variety of devices: desktop computers, laptop computers, tablets, smartphones, and yes, even the humble Zune. 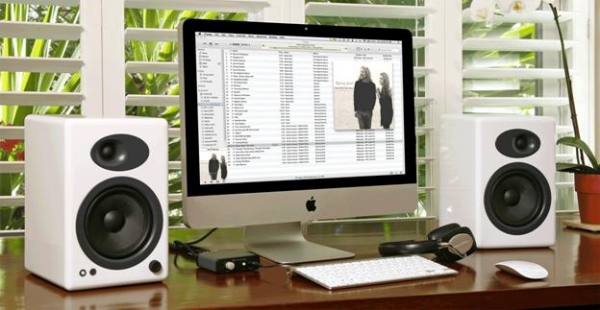 Ringing in at $399 USD, these are high-quality speakers that I guarantee will blow you away. How do you win this contest? Simply post a comment to this discussion thread (one entry per person) telling me what your current audio solution for speakers is and how the Audioengine A5+ speakers will be better. One winner will be randomly selected from amongst all the entries and they'll get to chose either a set of black or white A5+ speakers. Due to the size and weight of this prize, it will only be shipped within the continental USA. The contest will remain open until Friday the 28th at 12 PM mountain time (GMT -7). UPDATE: The contest is now over, and the winner is ITforSmallBiz. Thanks to everyone for entering!